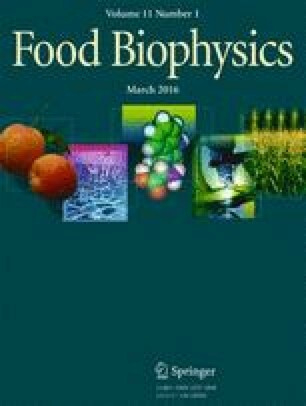 The aim of this research was to study which kind of conformational changes in gluten proteins were induced by addition of four dietary fibre (apple-cranberry, cacao, carob and oat) by using FT-Raman spectroscopy and to find relationships between conformational changes and rheological behaviour of bread dough in mixing and extensional tests. Structural studies showed that all fibres induced formation of β-like structures between two protein molecules (pseudo-β-sheets) with the band at 1616 cm−1 in the Raman spectrum. According to Principal Component Analysis, the strongest dependence was between changes in gluten structure and two extensographic parameters (resistance to extension and extensibility). Resistance to extension was positively correlated with content of α-helix and pseudo-β-sheets, while a negative correlation was observed between the parameter and content of β-sheets and β-turns. Gauche-gauche-gauche conformation of disulphide bridges and ability of tyrosine residues to hydrogen bonds creation improved mixing properties as stability of dough. The online version of this article (doi: 10.1007/s11483-015-9419-y) contains supplementary material, which is available to authorized users.